Desire to convert MPG to AVI? Firstly, try to know the difference between MPG and AVI. Also known as MPEG (Moving Pictures Experts Group), MPG is the file extension for MPEG-1 or MPEG-2 audio and video compression. MPG is created by Moving Picture Experts Group and widely-used in recording videos. And created by Microsoft, AVI is a video container format which can store both audio and video data. Usually, AVI is uncompressed and it will take up more space than MPG to store high quality video and audio files. On the contrast, MPG is a lossy format which will sacrifice video quality for smaller video size. And the most important thing is that all sorts of media players and mobile devices supports AVI format while MPG is not as popular as AVI. For example, PS4 and HTC Flyer fail to replay MPG format video. In addition to incompatible issue, sometimes you still have requirement to transcode MPG files to AVI for other reasons. Thus, how can you convert MPG videos to AVI in an easy way? * easily convert MPG/MPEG to AVI with original quality reserved for free playback with ease. * decode MPG videos to AVI in super fast speed thanks to its multi-core CPU utility, hyper-threading and Intel Quick Sync Video hardware acceleration techs. 5X faster than other MPEG to AVI converters on the market. * transcode any video to over 180+ video formats and 14 audio formats due to 320+ video and 50+ audio codecs, such as convert FLV to AVI, MOV to AVI, H.264 to H.265/HEVC, MKV to MP4, AVI to MP4, VOB to MP4, AVCHD to MOV, MP4 to MP3, etc. * free download videos from YouTube, Facebook, Dailymotion, Vimeo and more 300+ sites in AVI, FLV, MP4, MOV, 720P/1080P HD, 4K UHD, etc. * freely edit AVI videos by trimming, cropping, merging, adding subtitles/watermarks, etc or even compress AVI file. 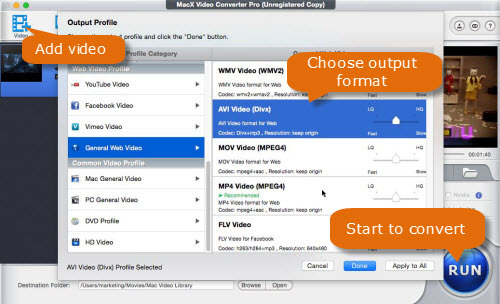 Before the video conversion, you should download this AVI video converter on your Mac computer (macOS High Sierra included); you ought to download Windows version (Win 10 supported) if needed. Next, follow the steps below to start MPG/MPEG to AVI transcoding. Step 1: Open up the video converter for Mac/win and then click "+" icon to import the desired MPG file. Or directly drag & drop MPG files to the app interface. BTW, you are allowed to add more than one video files at a time. Step 2: Go to "General Profiles" category to choose AVI as the output video format. You also can choose 350+ preset profiles as output format, for instance, iPhone X/8/8/7/6S/6 Plus, iPad Air 2, iPad Mini 4, iPad Pro, iPod, Apple TV 4, iTunes, iMovie, Samsung Galaxy S8/S7 edge, HTC One M9, Amazon Kindle Fire HDX8.9, Google new Nexus 7, Surface Pro 4, etc. Step 3: Click "Browse" button to specify an output folder to save the converted video file and tap "RUN" button to start to convert MPG to AVI. The above steps are also suitable to convert MKV to AVI, VOB to AVI, MTS to AVI, AVI to MPEG, AVI to MOV, AVI to iTunes and more. Free download the best AVI video converter for Mac/Windows to encode/decode MPG files to AVI, as well as MKV to AVI, M4V to AVI, AVI to MP4, AVI to iPhone, MKV to iPhone, YouTube to MP4/MP3, etc with original quality reserved and world's fastest speed.